I have always made this appetizer when I wanted to have something for the kids at a party that was a little fancier than throwing goldfish crackers and cheetos in a bowl. However, what I have found is that adults love them too. In the past I have made them with herbed goat cheese or cream cheese where I added my own fresh herbs but they seem to be most enjoyed when the prosciutto is spread with already whipped chive and onion cream cheese. It also makes it so much easier. This is a quick and easy dish to round out your appetizers for a get-together. 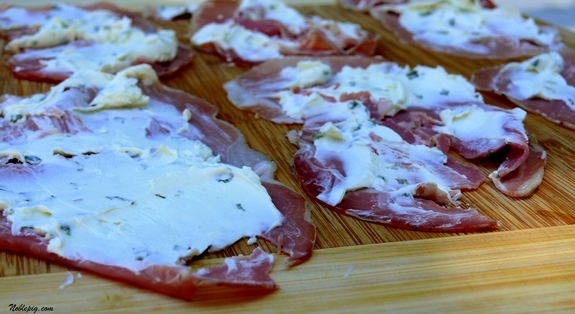 Lay prosciutto on a cutting board or wax paper. Spread cream cheese over prosciutto with an offset spatula. 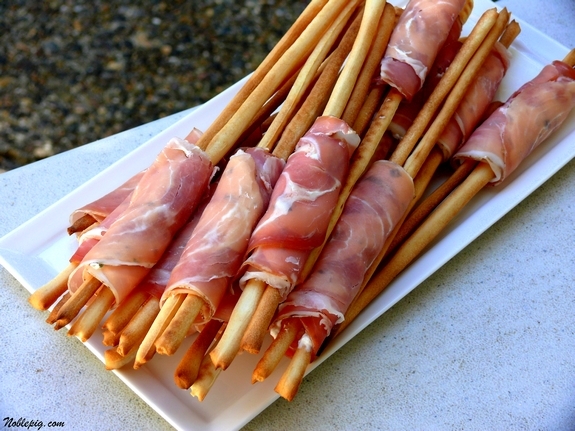 Roll one slice of prosciutto around two breadsticks, so that the cream cheese sticks to the breadsticks. Repeat with remaining prosciutto and breadsticks. Kids and adults will love these! I love the look of this easy to fix appetizer. Thanks for this one. I am afraid I would have to double the recipe though, because I bet they would go like a wildfire! 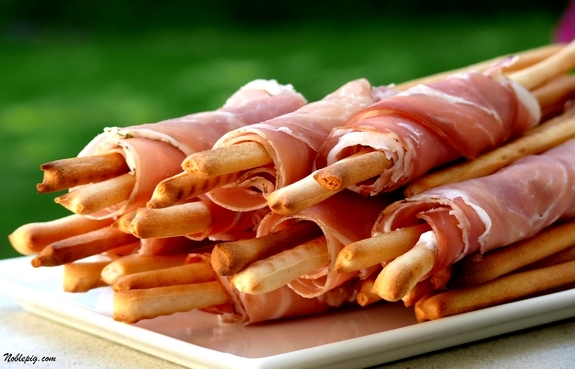 So, for my hungry horde, we’d need about 150 of those adorable little bread sticks, and something like 75 slices of prosciutto, right? I think I’ll let them have goldfish and cheerios, not that I serve them appetizers anyway. These look wonderful; will you send me some? Easy and tasty! It doesn’t get any better than that. This is my kind of snack. That looks simply yummy, I have not had this particular appetizer before, YUM! I just know this is going to ne an awesome snack at my next party!!! Meat and cheese on a crunchy breadstick? I’m in! Oh that such a nice surprise inside the prosciutto. I am liking this idea. Thank you Cathy!